Briars may attempt to choke the power of the seed of truth—keep planting, for God’s truth will stand. 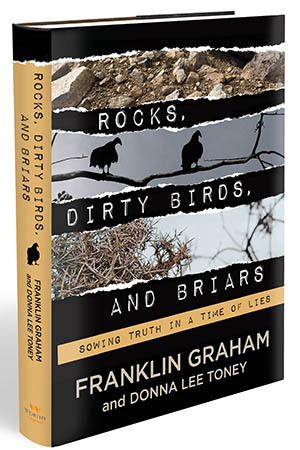 This is a truthful evaluation from Franklin Graham in the foreword to a book we have written, Rocks, Dirty Birds, and Briars, which was released in August by Worthy Publishing. America needs a spiritual transformation from the godless to the godly! It will only happen if we turn back to God, who offers true freedom. The urgent need for our nation is obvious: to humble ourselves before Him with repentance and through prayer, asking Him to intervene for His glory and honor. This has been the focus of Franklin’s Decision America Tour. 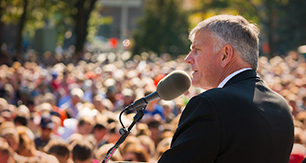 Our nation is broken—politically, morally and spiritually. We must pray fervently that God will turn our nation back to Him who blessed it in the first place. Those who follow Christ are called to be sowers of the Gospel truth even in a time of lies. News headlines reveal that many people are cynical about the truth, shrugging their shoulders at lies. Religion is also a hot topic that has driven the media to dig for answers to the question, “Who is really a Christian?” The answer is hard for many—even those who claim the Christian faith. But it has opened up a worthy discussion and driven people to the Bible. Here is what God’s Word says: “You know the difference between truth and lies. And who is a liar? Anyone who says that Jesus is not the Christ” (1 John 2:21-22). “For the Spirit teaches you everything you need to know, and what he teaches is true—it is not a lie” (1 John 2:27). “Those who have been born into God’s family do not make a practice of sinning, because God’s life is in them … So now we can tell who are children of God and who are children of the devil. Anyone who does not live righteously … does not belong to God” (1 John 3:9-10). The Bible says that Satan is “the prince of the power of the air” (Ephesians 2:2, NKJV), and we can certainly see the manifestation of this today in the messaging that dominates the media. Because technology has connected people to one another with a tap or click on a mobile device, the seeds of accusation are flung into cyberspace and tweets mount up quickly before anyone can determine whether they are truth or fiction. The only search engine that can bring clarity to the “truth versus lie” debate is God’s Word. He has given us the engine of truth, not to browse, but to study. Its power is demonstrated in clarifying fact versus fiction. So as we consider rocks that break us, dirty birds that hover over us, and briars that entangle, let’s consider the following facts. Rocks over the course of time can transform from one type into another. Rocks can represent strength, as in building a house upon the rock; or they can be used in the hands of cowards who get a kick out of throwing them at others. The latter is a picture of Satan, persuading others to carry out his evil deeds. He embeds his hatefulness into the hearts of mankind, all too anxious to do harm. The Bible says that Satan himself transforms himself into an angel of light to do the work of iniquity (2 Corinthians 11:14). Dirty birds are buzzards and vultures, thieves and predators up to no good. They swoop in to steal seed that a hardworking farmer has planted. Satan is a dirty old bird when he plucks seeds of truth from human hearts that are dying in sin. The Bible tells us, “Wherever the corpse is, there the vultures will gather” (Matthew 24:28, NASB). 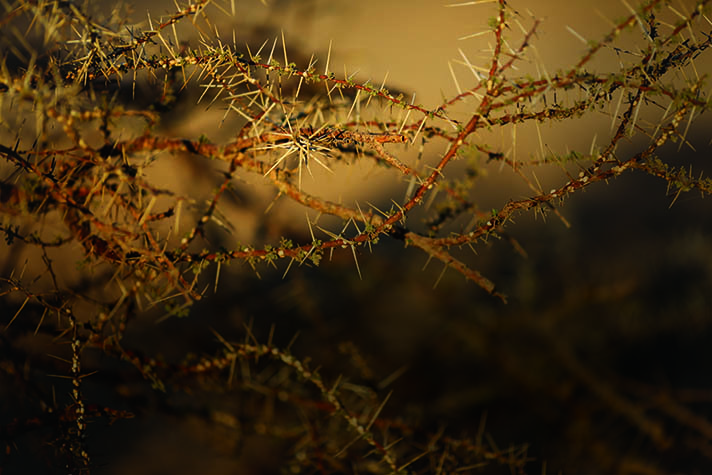 Briars are a mass of thorns and prickly stems twisted like a network of wires. They are a barrier to the rain that waters the seed; a thorny trap that rips open flesh, leaving the sting of horror and scars that linger. They are good for nothing! “But if a field bears thorns and thistles, it is useless. The farmer will soon condemn the field and burn it” (Hebrews 6:8). The biggest lie that Satan plants in the human heart is that God’s Word is not truth. He is going to do everything in his power to scorch out, choke out and steal away God’s truth. But this fact is absolute: God’s Word is the Gospel Seed that produces truthfulness, holiness and obedience—and we are called to plant it. Christians are called to sow truth in a time of lies. Rocks may be thrown at you—duck! Dirty birds may try to steal the seed of truth from your heart—hang on to it! Unless otherwise noted, Scripture is taken from the Holy Bible, New Living Translation, copyright ©1996, 2004, 2007 Tyndale House Foundation. Used by permission of Tyndale House Publishers, Inc., Carol Stream, Ill. The Bible verse marked NASB is taken by permission from the New American Standard Bible, ©1960, 1962, 1963, 1968, 1971, 1972, 1973, 1975, 1977, 1995 The Lockman Foundation, La Habra, Calif. The Bible verse marked NKJV is taken from The Holy Bible, New King James Version.